Zeigler High School "Purple Tornadoes"
Zeigler (population 1,669) is located in southern Illinois in southwestern Franklin County. Illinois State Routes 148 and 149 intersect in the city. Two railroad lines, the Missouri Pacific and the Illinois Central Gulf, also intersect in town. The Big Muddy River runs just to the south of Zeigler. The town was incorporated by Illinois in 1914 making it one of the "newer" towns on this site. The basis for the town's establishment was the formation of underground mining in the area. For location sake DuQuoin is located about 12 miles northwest of Zeigler and West Frankfort is located 6 miles to the east. 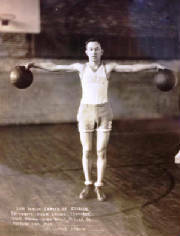 A great web site to learn more about Zeigler is found at http://www.zeigleril.com . The School system in Zeigler is documented at http://www.zeigleril.com/pages/schools.htm. Zeigler began a school system soon after its first houses were built. As Zeigler grew and prospered so did the educational facilities. The first school house was the "Block School" pictured below. In the 1920s the school pictured above to the right was built. This served the children until the 1960s when the building was demolished and a new building was erected. The grade school pictured below was used for the high school for a bout three years until the new building was finished. their efforts. The Zeigler-Royalton School District was established ending the solo efforts of the two towns. If you would like to add any information regarding Zeigler High School please e-mail us at eganann@sbcglobal.net. School nickname: the "Purple Tornadoes"
We're loyal to you Zeigler High. We're purple and white, Zeigler High. For we know you have sand, Zeigler High. So crack out the ball, Zeigler High. We're backing you all, Zeigler High. Victory from you Zeigler High! Dear Alma Mater, Zeigler High! Zeigler High School definately offered basketball, football, and track. If you have information regarding the Zeigler High School athletic program please e-mail it to us. Only the three seasons of IHSA success are listed on the IHSA web site (www.ihsa.org) regarding Zeigler High School boys basketball. Those three years however ended in Sweet 16 appearances with one even extending to the Elite 8! This accomplishment is unique also because all three appearances were under three different coaches and within a four year period. The teams and their great seasons are listed below. "Sam Ranich center of Zeigler Community High School - Team 1927. Only known high school player to perform this feat. By Clarks Studio"
Two Zeigler High School boys brought home medals from the IHSA State Track Meet under the one-class system. "Local teams standing head and shoulders above all other area teams include the famous Purple Tornadoe football teams of 1932-1934. Not only were these teams undefeated for all or part of three season, but they were unscored upon. Not until late in the 1934 season did an opponent, DuQuoin, cross the Tornadoe goal line. This dismal event occurred during the most important game of that season. 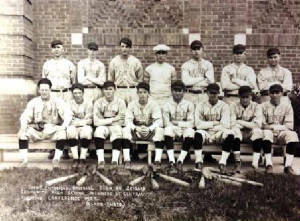 In a game played at the DuQuoin State Fairgrounds, the DuQuoin Indians were pitted against the Purple and White crew for the championship of the Central Egyptian Conference. When the smoke had cleared, the Indians had won the confernce title, handed defeat to a Zeigler team for the first time in nearly three years, and had scored a touchdown against the toughest defense in southern Illinois. Final score DuQuoin 6, Zeigler 0." I am not sure if it was the season before or not, but the closest a team came to scoring against Zeigler was a 35 yard field goal attempt by Pinckneyville." 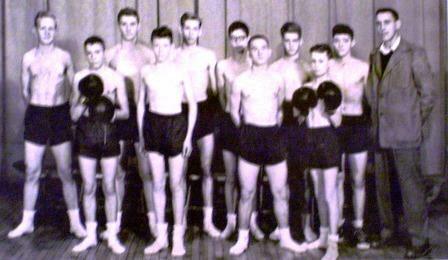 The Zeigler boys competed in boxing for a short while in the 1950s. The photo below was scanned from a 1954 Ziegler High School yearbook. It was sent to us by Adam Rosoho. The only information supplied in the year book that accompanied the photo included that decisions that year were won by Jerry Capps and Jim Welch Further results and information are being sought. The Zeigler High School Tornadoes competed in baseball too. Any information including records and coach's names are welcome. We do know this for sure, that the school produced some great athletes during its existence. Michael Milosevich, infielder with the Yankees in 1944 and ’45, died at East Chicago, Ind., February 3. He was 50 years old. A high school star at Zeigler, Ill., Milosevich was working in a steel mill and playing semi-pro ball at Steubenville, O., when he decided to take a crack at O.B. in 1935. Milosevich followed Bengough to Joplin (Western Association), where he played the next two seasons. After four years at Binghamton (Eastern) and two at Kansas City (American Association), he finally was brought up to the Yankees. He appeared in 94 games in 1944 and 30 games in ’45, batting .247 and .217. Sent back to the minors, he ended his career in 1951 after serving as player-manager of Baxley (Georgia State) and Americus (Georgia-Florida)." How Many Big Leaguers Has This Area Produced? The recent death of Mike Milosevich of Zeigler has stirred up memories of former major league baseball players from Southern Illinois? How many can you name? **Mike Milosevich did not forget his roots. He is buried in the Zeigler Cemetery north of town. Special gratitude goes out to Peg Carpenter, Library Director of the Zeigler Public Library for her research in locating these articles. "This town (Zeigler) had some great athletics in the late 30's and early 40's. Many of them played at SIU, two or three on the NAIA National Champion SINU basketball team. Two Milosevich brothers and Shaeffer played on this team and Bill O'Brien, same time frame in Ziegler, who played football at SINU before and after the war later coached at SINU and became a long time referee in the National Football League. Coach Glen Whittenberg (a Carbondale native) and coach of the 53-57 football teams at Ziegler, later coached basketball at Proviso East High School, winning a state championship in the early 1960's." *Gordon Butler - another great Zeigler athlete. After playing high school sports (football, basketball, and track (no Zeigler high school baseball, at least at that time), he signed a contract with the St. Louis Cardinals and played three years, 1954, 1955, and 1956 in their farm club: two years at Dothan, Alabama, and one year at Winnipeg, Canada, before dropping out to finish his college education as he had received his draft notice for the fall of 1957.